Looking for a quick new distraction guaranteed to eliminate boredom? 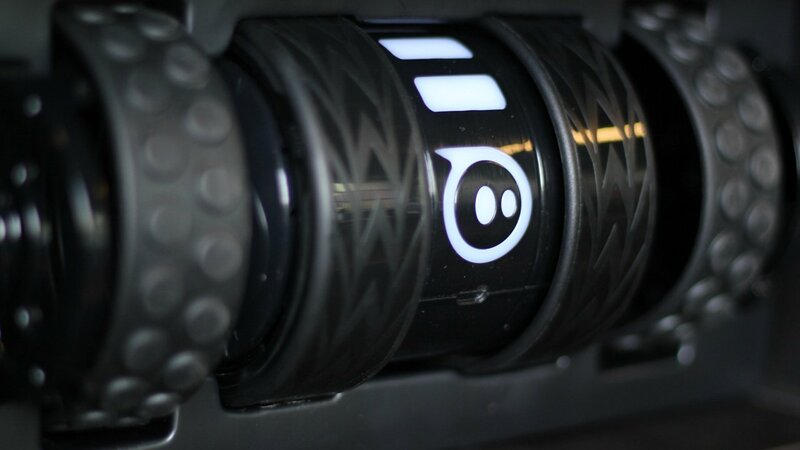 The Ollie from Sphero may be the product for you. This app-enabled device lets you drive from your smartphone on any terrain of your choice at a speed of 14 miles per hour. That’s not all either, as the name ‘Ollie’ suggests, the device will also allow users to perform a series of tricks by simply obeying the simple gestures on your phone sent from the dark side of the force. I wish I were kidding, but this version of the ‘Ollie’ is clearly Star Wars inspired and picking up one of these for the retail suggested price of 99 dollars will seal your loyalty under the whim of the Sith. The device was released in white prior to the black version. In the box you’ll get a pair of inside wheels, hubcaps and a Micro UBS cord to charge the device, which can take up to an hour. In turn, it will provide the same allotted time of just one measly hour whenever you are ready to take it for a spin. But the most useful item in the box is what you’ll be using most of the time; the rubbery tires made flexible to switch to outdoors. They are made of polycarbonate (Han Solo style), which is designed to lessen rough drops or tumbles on tough surfaces. The thing is a beast. In my evaluation, I found drops even from several feet made no difference in quality or feedback from my iPhone. To get started, you’ll need to download the Ollie app available in the App Store and the Android Marketplace for free. There you will be prompted to link both devices via Bluetooth. The device is compatible with Bluetooth LE- in other words is Blue tooth 4.0. Still talking gibberish? That basically gives you 30-meteres to drive, perform tricks, jumps and stunts at your discretion away from your iOS or Android device. Driving mode is essentially how you would hold your phone for daily tasks such as texting, but to switch to ‘Trick Mode’ you’ll have to shift your device to landscape mode at a 90-degree angle. The app is seamless and easy to comprehend. If the device is moving too fast you can adjust the speed and handling controls within the app to your driving preference. There are even a few presets that offer slightly different driving experiences. The suggested speed of 14mph or 6 m/s is accurate. Ollie performs best when on a flat open plane environment. No need to worry though, it performs admirably on grass, sidewalks or any other slightly bumpy surface besides obviously sand. Only thing is when you switch from different terrain you may need to recalibrate with the device. I noticed sometimes the controls can be wonky at times when the device isn’t directly in front of you. At first, when you ‘wake up’ the device it asks you to make sure the USB slot is facing the device for a smooth optimal experience, and for the most part it is, but when you start going crazy with tricks the device will unintentionally do the complete opposite from what you tell it to, but it doesn’t happen enough to warrant any concern. Despite poor battery life and the odd hiccup in the control scheme, Ollie is a fun ride. Its one hour battery lifespan will die faster than you know it, if you plan to use it for the long haul for activities like going to a skate park with friends or wherever you go in your spare time. Waiting an hour to charge and getting the same back can become cumbersome but if you are intending to use to for a short play distraction, this device is up your alley. Tasks such as keeping your pets entertained or going for a walk to clear your head are ideal for Ollie. It all depends on how you plan to use it but it truly is nifty tech when considering everyone now, or at least should, own a smartphone. The asking price of $99 dollars may be asking a lot to some but the tech certainly justifies the tag. Other accessories are also available if you find yourself needing to spice up the experience with different tires, new hubcaps, and a Bluetooth ramp at your local Best Buy or other electronic chain equivalent. Overall, the Ollie, ‘Darkside’ edition is a neat companion to follow you around the house or wherever you plan to venture off to. Ollie will be there, possibly slightly ahead of you or behind you. Don’t you fret though; the presence of the dark side will drive you. Ollie is surprisingly a durable robot ready stroll at top speed down any corridor whilst performing stunts for your pleasure. At a reasonable price, If you got the cash and have a smartphone, go buy RT-D2’s distant cousin. Overall, the Ollie, ‘Darkside’ edition is a neat companion to follow you around the house or wherever you plan to venture off to.